Anyone else notice it seems to be baby season? Many of my friends have either just had, or are having babies right now. For the ones that are planning on formula feeding like I did with my boys, I wanted to share something interesting. When I had my 1st child, The Big Guy, we tried both Enfamil and Similac. In my mind those were really the only formula choices. He didn't really like the Similac and neither did I. We had fallen in love with Enfamil from the get go. Eighteen months later, he had been off of formula for awhile but now my husband and I had newborn twins. That's right. Two babies to formula feed. And my little guys were not small. For a few years we actually held the record at the local hospital for biggest.twins.ever. Ever! I swore by Enfamil. They were on 3 different kinds of Enfamil - the Lipil, the AR Lipil (with the rice in it), and even the Gentlease at one point. We only used the AR Lipil and the Gentlease briefly before we were back to the regular Lipil. I raved about this formula to everyone. It was so freaking expensive but there was no way I was going to give the boys anything less. At the time we were shopping at BJ's Wholesale Club buying the largest cans they made - and the boys went through two of those. A week. It was about $30 a can... so $60 a week at one point... totalling over $240 a month just for formula. A few friends of mine who also had babies at the time told me how they were switching over from name brand formula. With Enfamil advertising that their formula was the only formula that contained DHA & ARA, there was no way I was switching. Fast forward to April 2009. PBM Products Inc won a court case against Mead Johnson in a false advertisement lawsuit. This April (2011), the court upheld that verdict after Mead Johnson Appealed. That's right folks. Enfamil was not the only one with DHA & ARA. And those other formulas? Could be purchased for sometimes half the cost of what we paid for the Enfamil. While I do not have any babies on formula currently, I wanted to share this with my friends who do. If my husband and I finally get around to having that 4th we are famous for going back and forth about, I will definitely be trying a brand like Parents Choice Baby Formula. Check them out for yourself. They have several choices comparable to all the kinds of Enfamil we used, and there is even a price calculator on their site which shows just how much you can save. If I only knew then what I know now. I was such a formula snob. Kind of like how I was also a diaper snob and didn't catch on until nearly the end that the Target brand of diapers were just as good as Pampers (and way cheaper too). If only I had realized that when all 3 boys were in diapers. But that's another story for another time. Are you formula feeding? 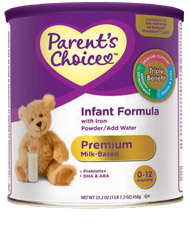 Try Parent's Choice and let me know what you think. I'd love to hear from you. Thanks so much for this post! I am so grateful that I was able to use Parent's Choice with my girls! I hope that more parents learn about the savings they could have if they used Store Brands over the really expensive name brands. Like you, I know a lot of people who are afraid of store brands, or think that store brands are cutting corners, and that's why they're so inexpensive. It's not that at all. The main reason Store Brands are so much less expensive is because the name brands pass on their marketing costs to the consumers. Seriously, all the *free* samples that go to hospitals, all of the magazine or tv ads.. They have to get the money somehow... Why not pass the costs on to the consumer? It frustrates me. It's not fair, so thank goodness the Store Brands are there to help the consumers save money!